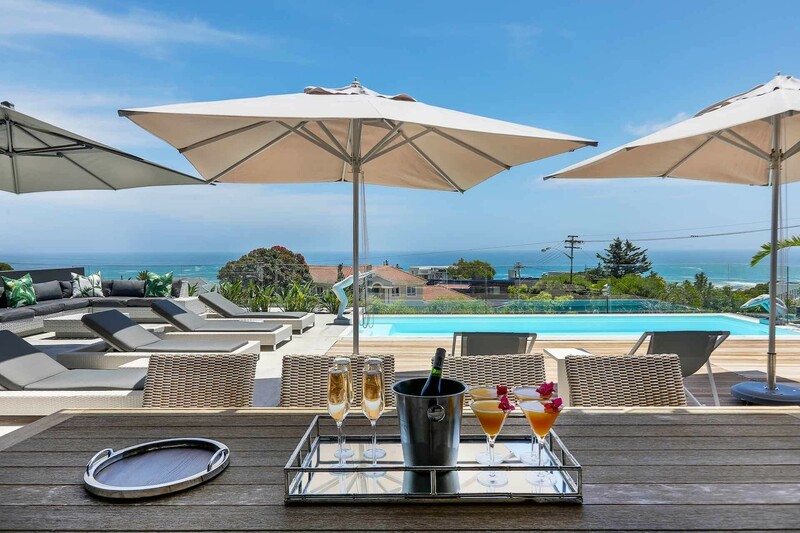 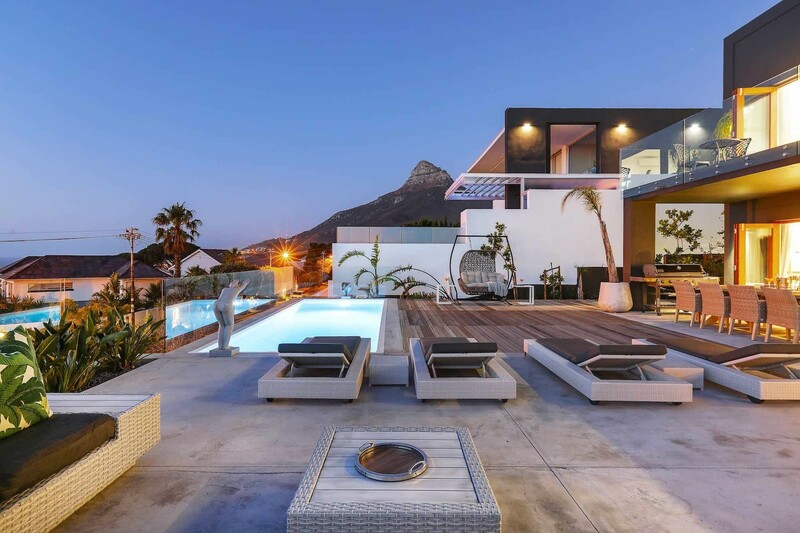 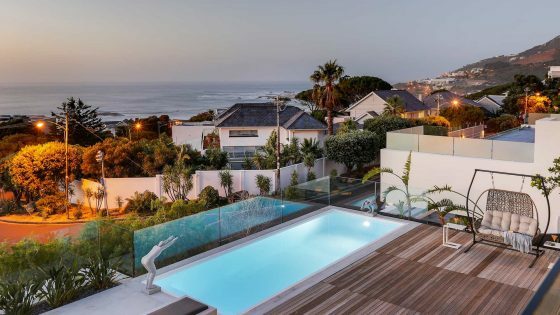 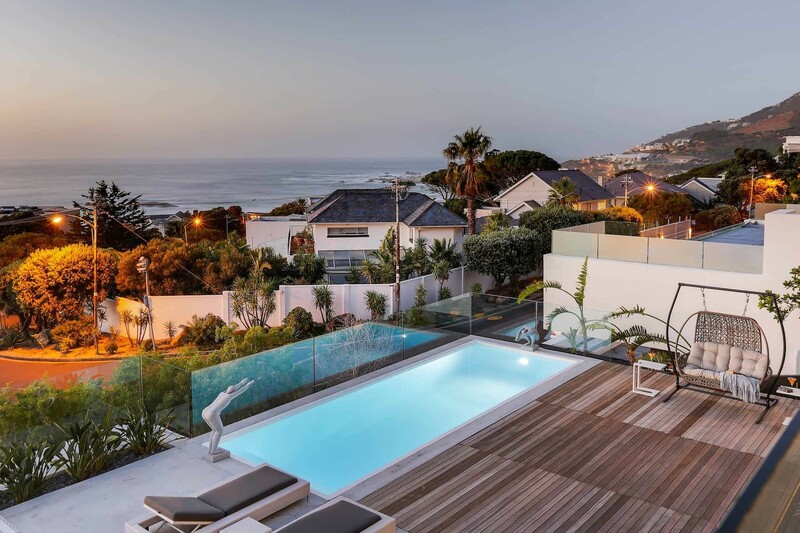 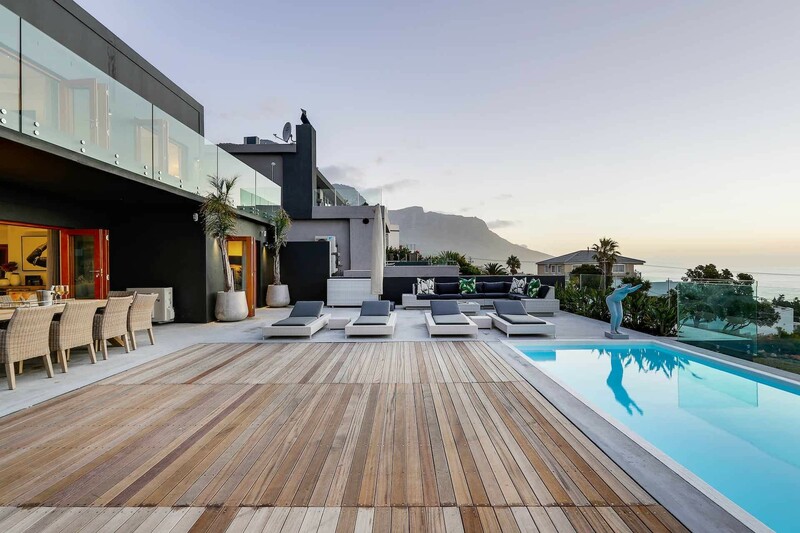 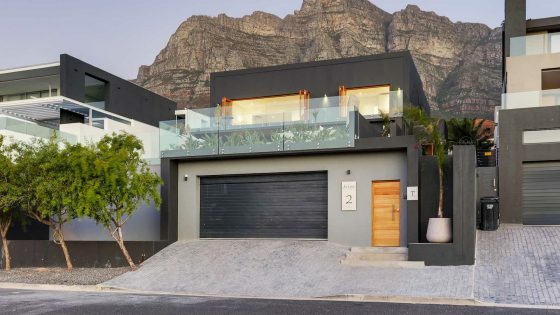 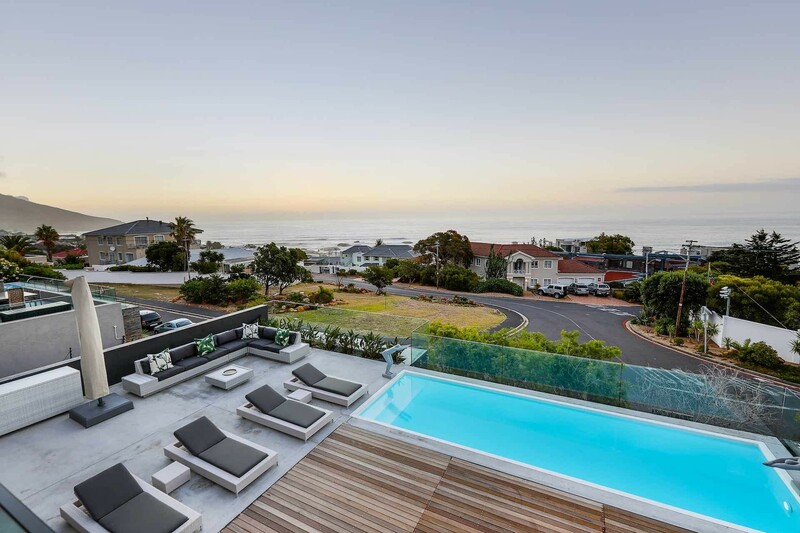 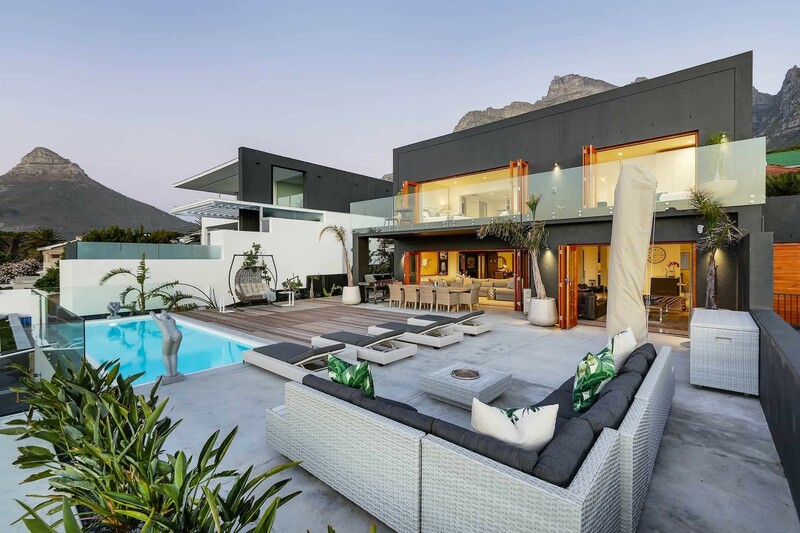 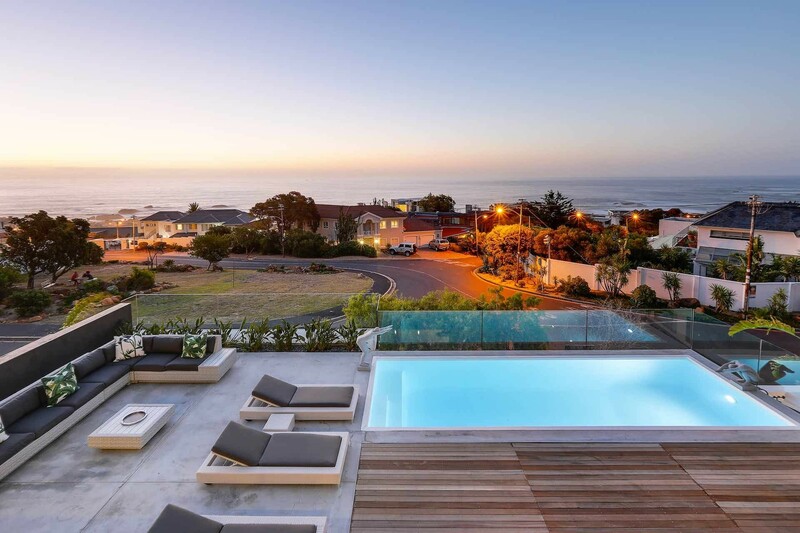 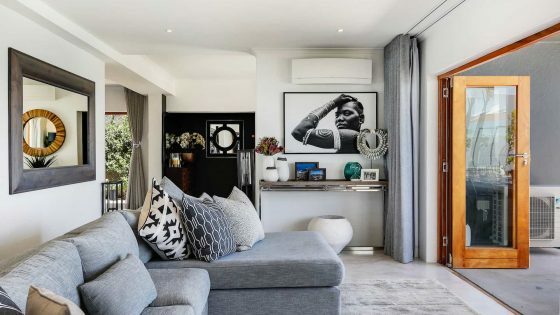 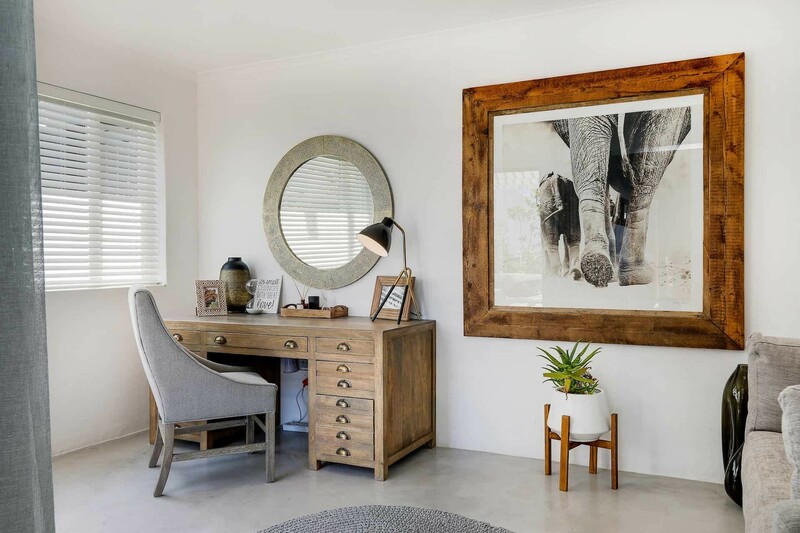 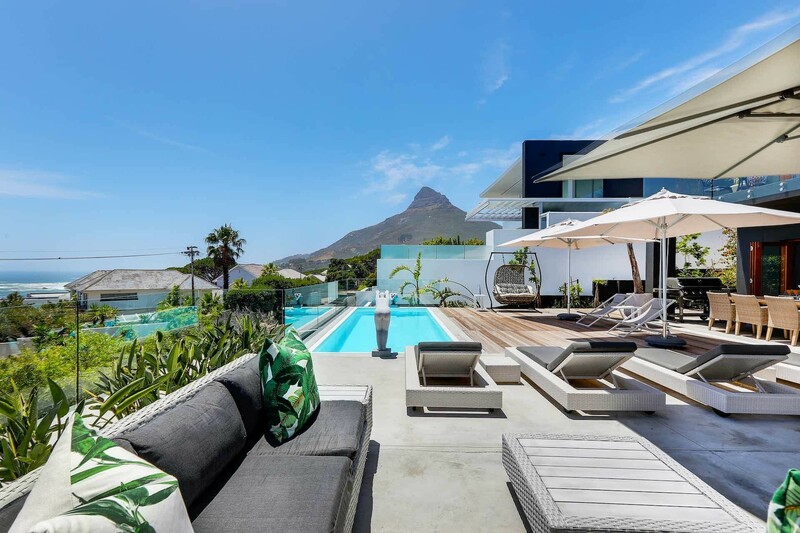 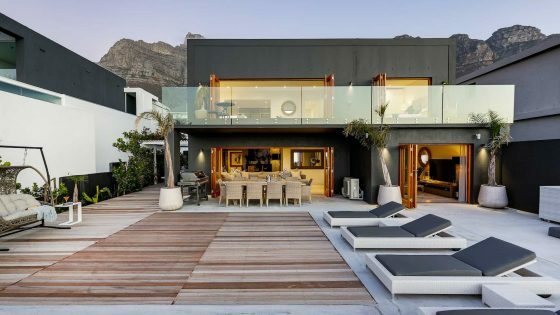 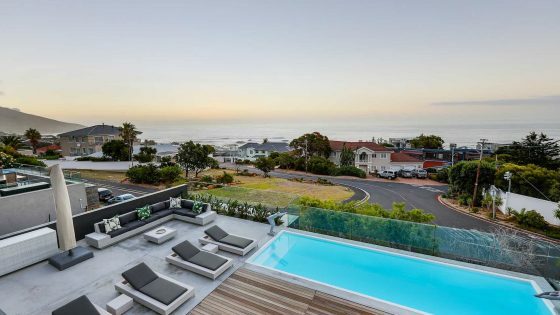 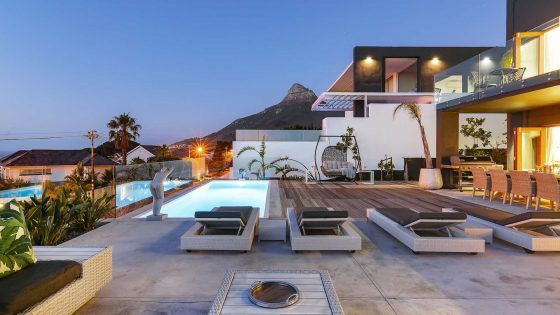 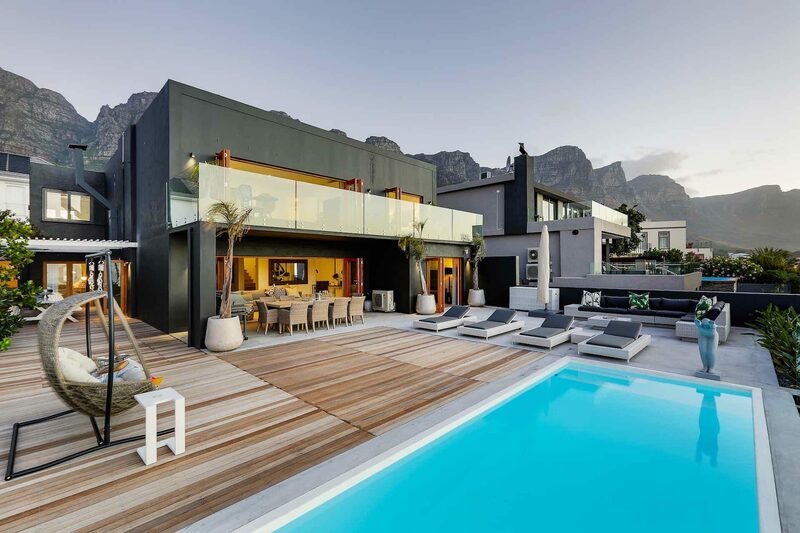 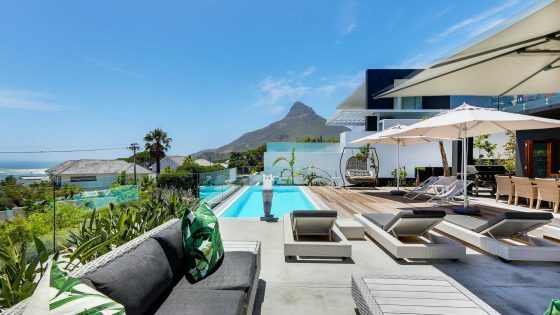 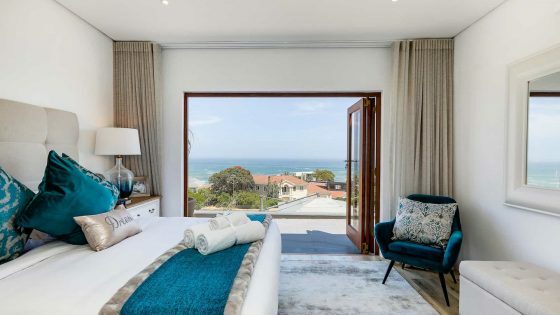 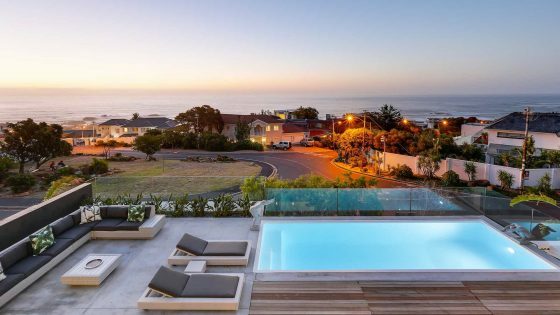 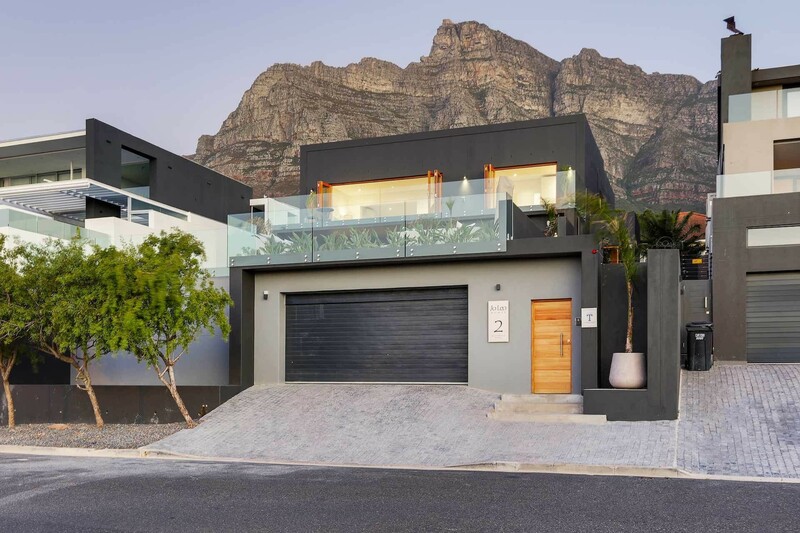 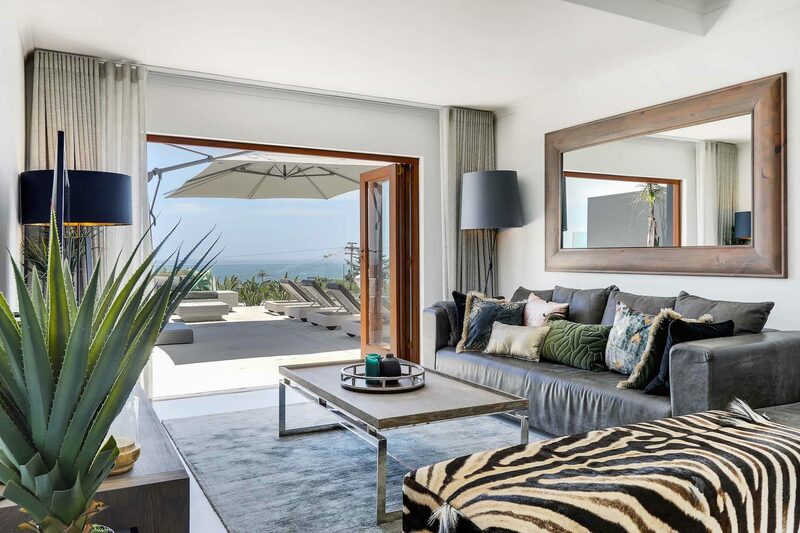 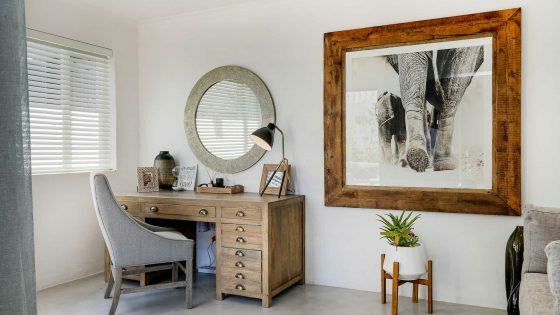 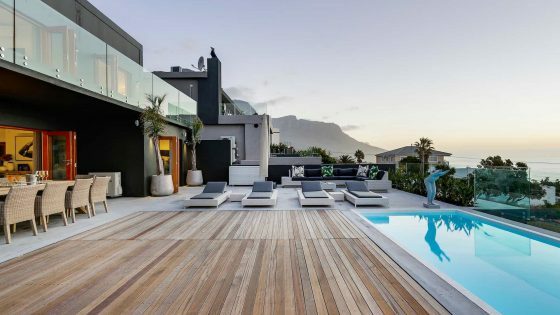 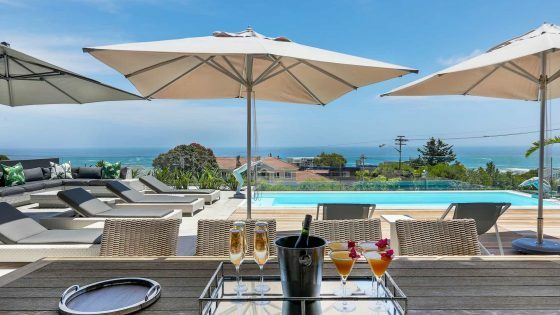 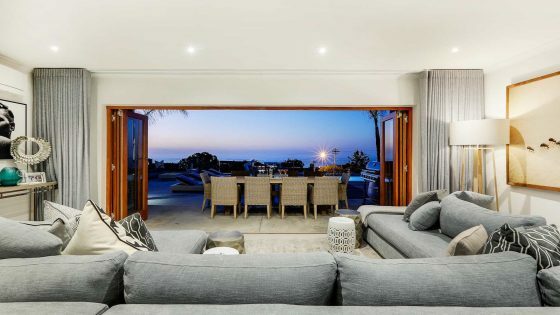 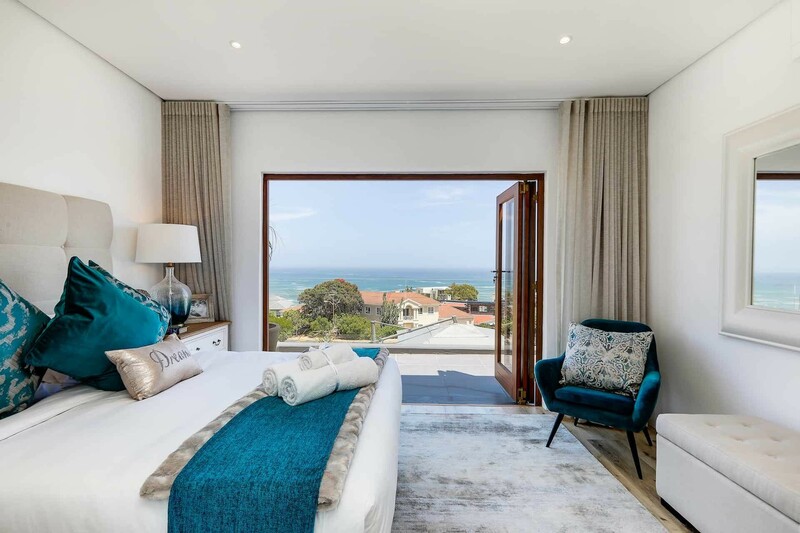 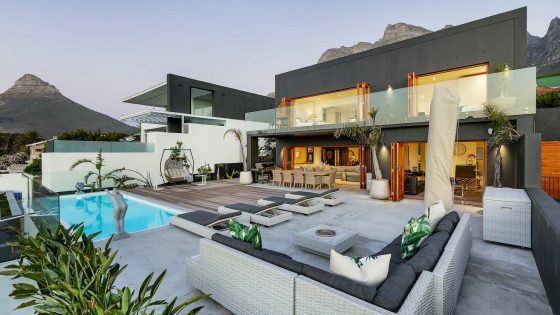 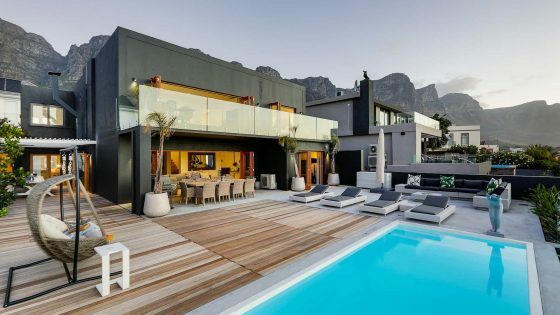 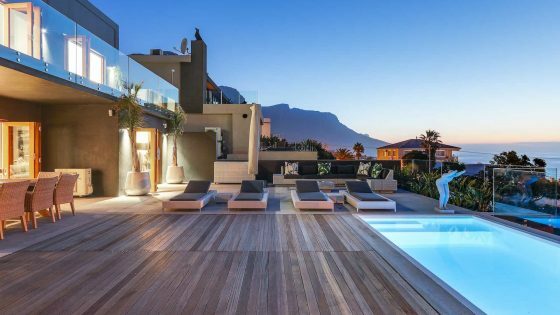 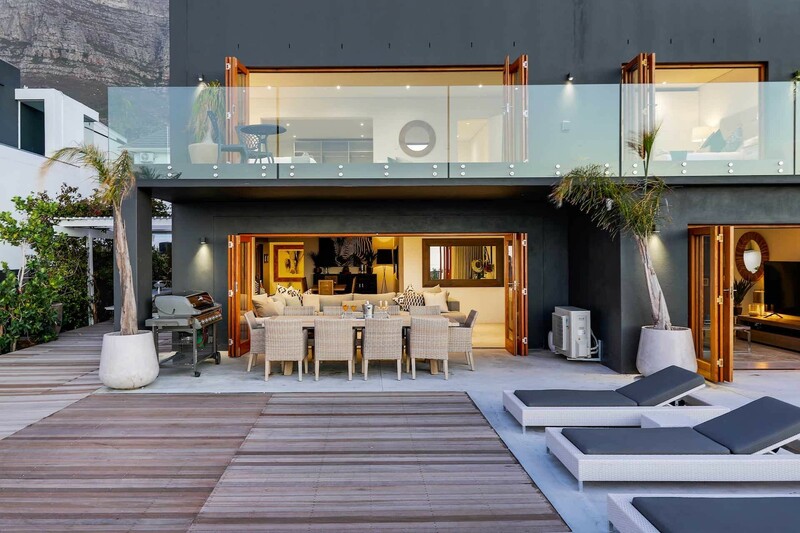 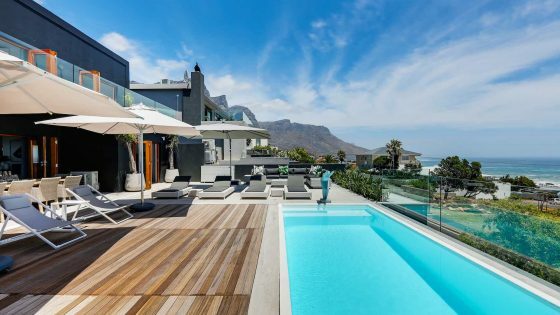 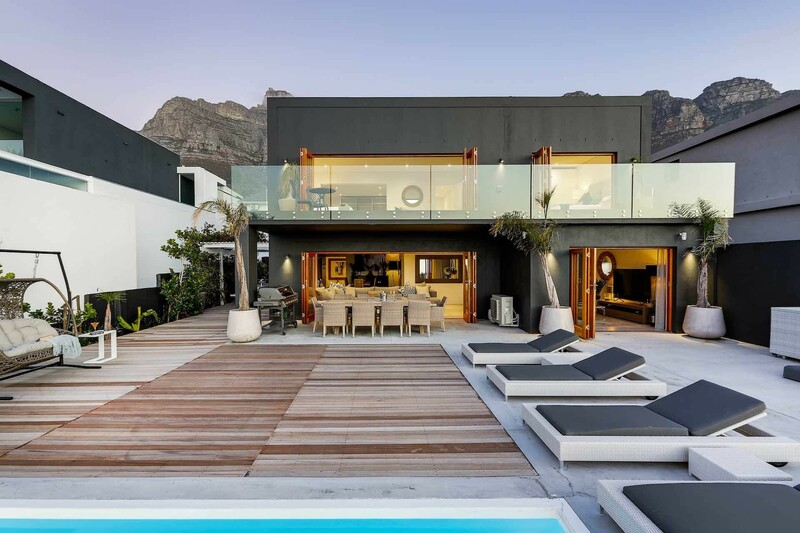 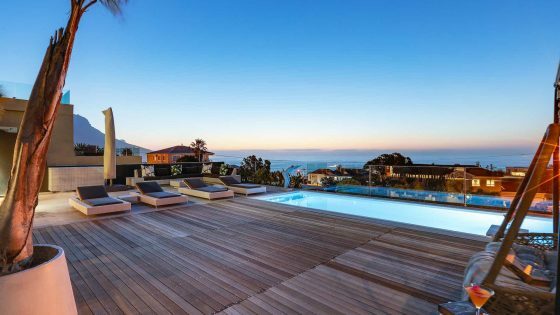 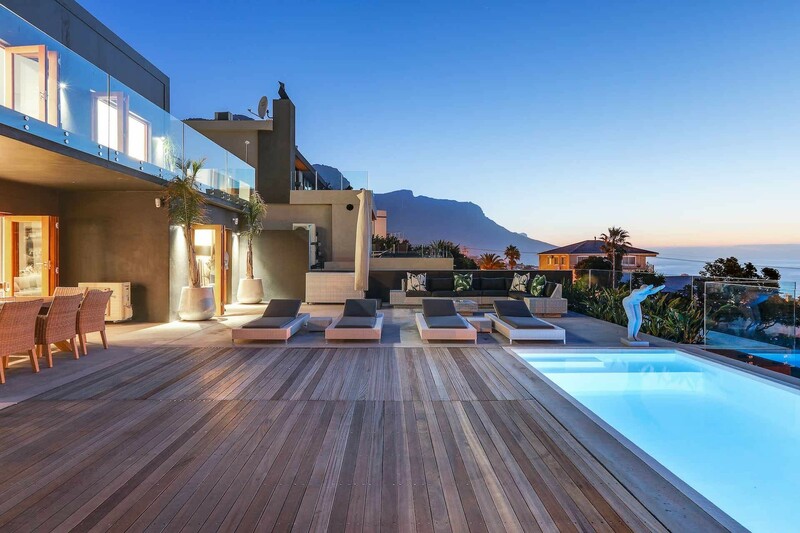 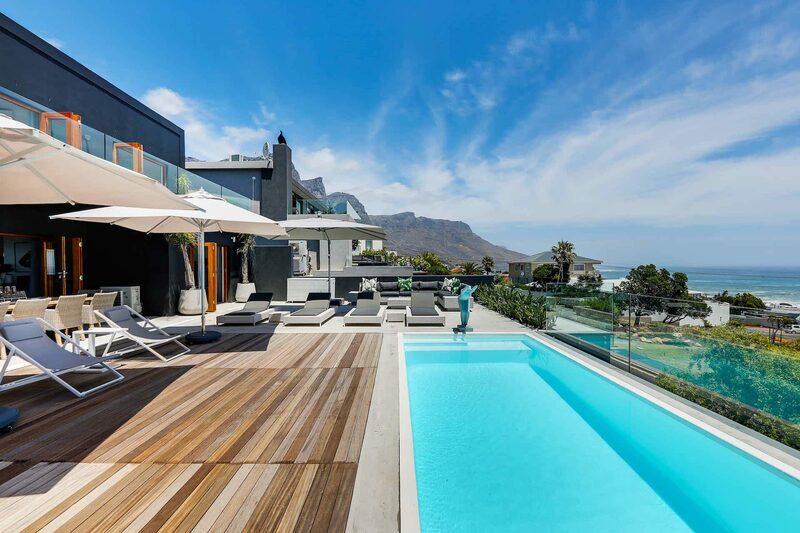 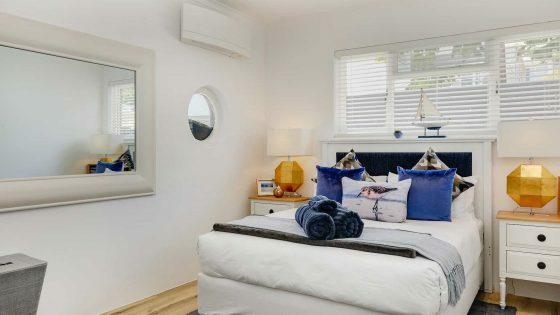 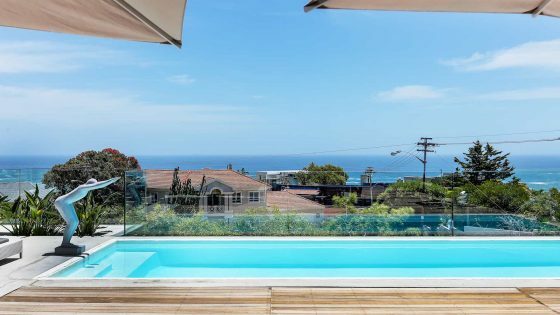 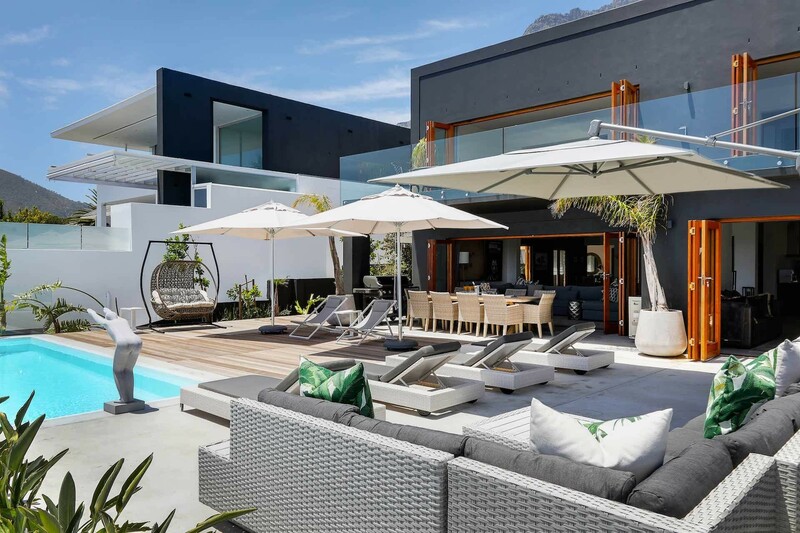 Resting beneath the Twelve Apostles with breath-taking mountain and ocean views, this beautifully designed house is split over two levels, exuding modern comfort and style. 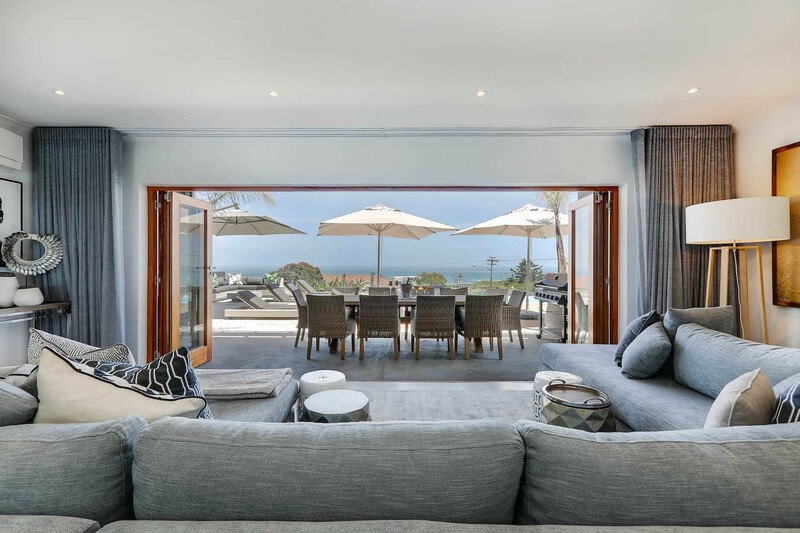 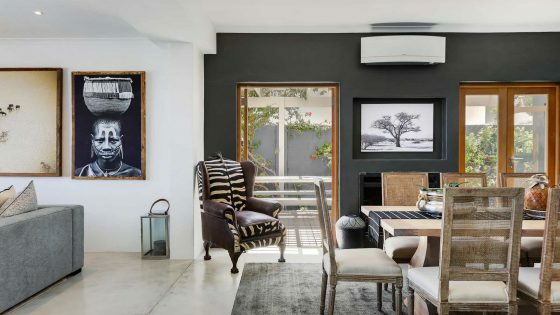 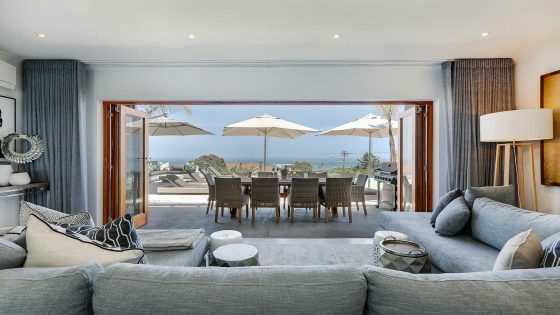 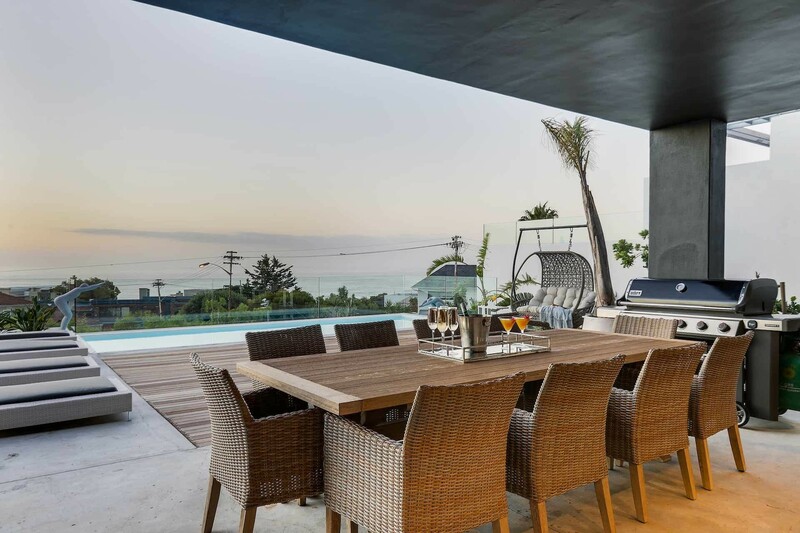 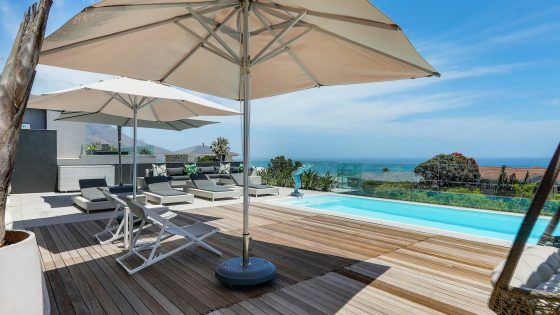 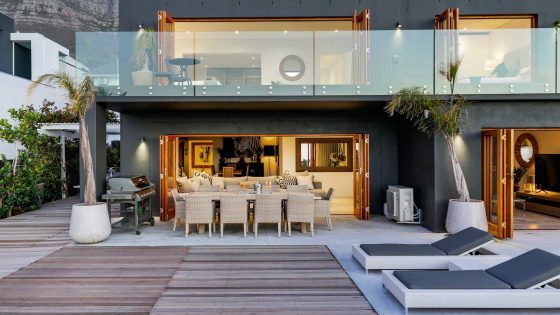 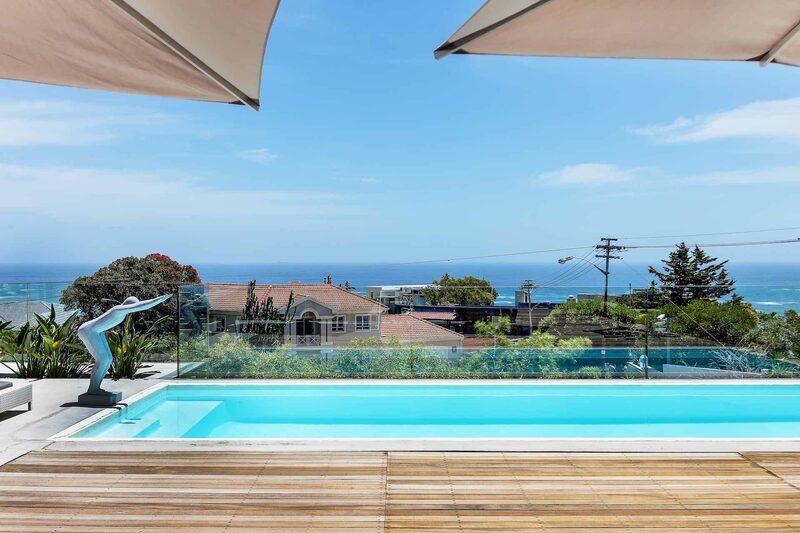 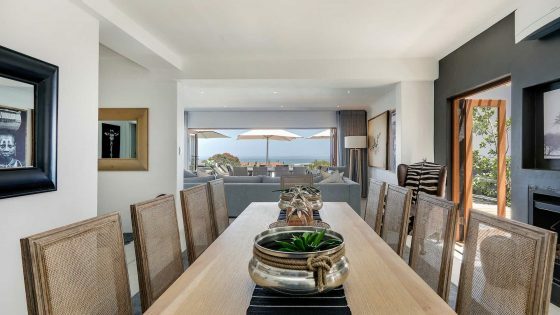 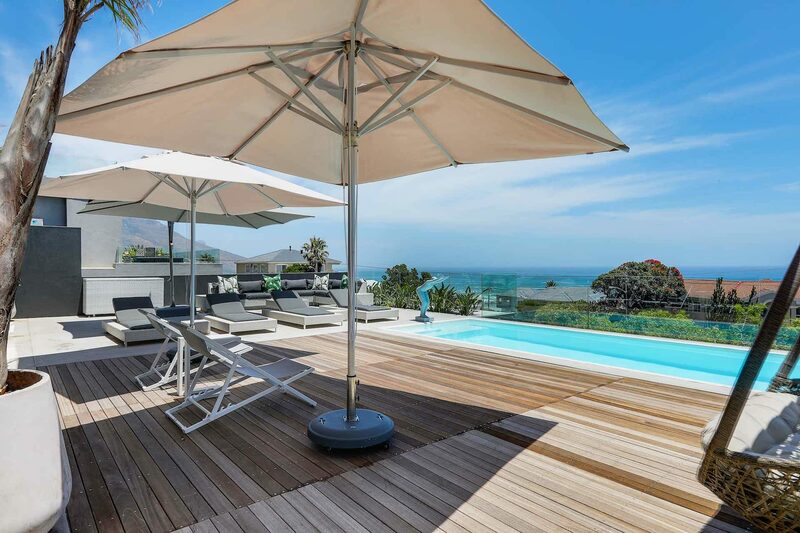 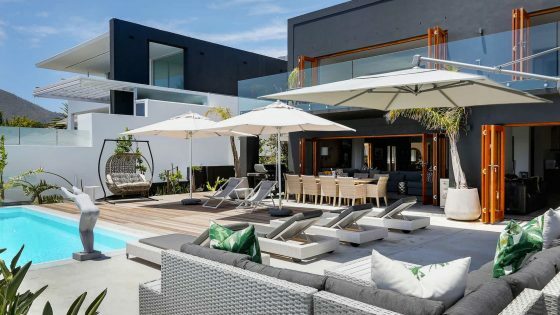 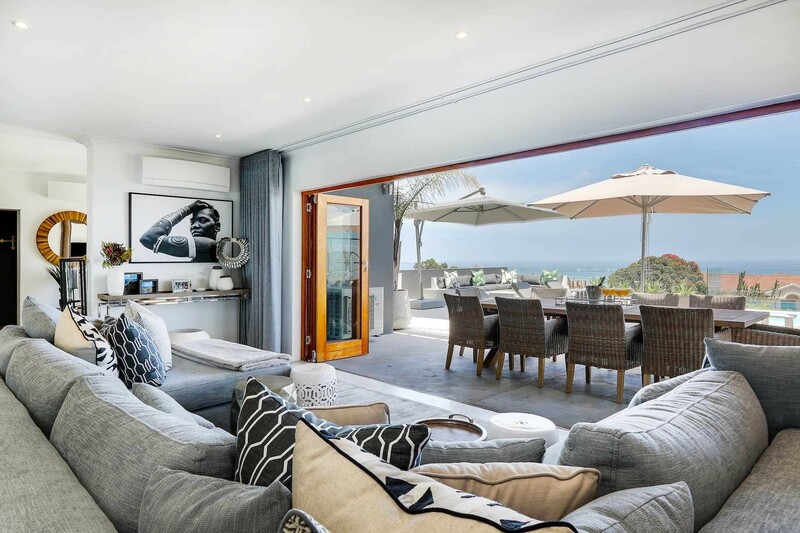 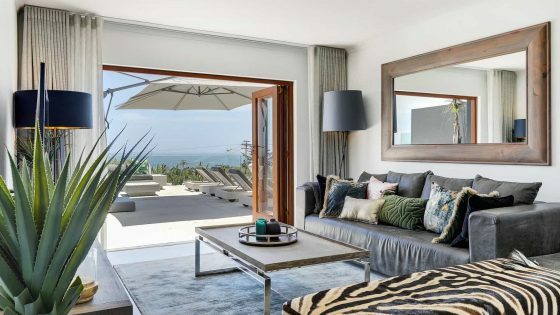 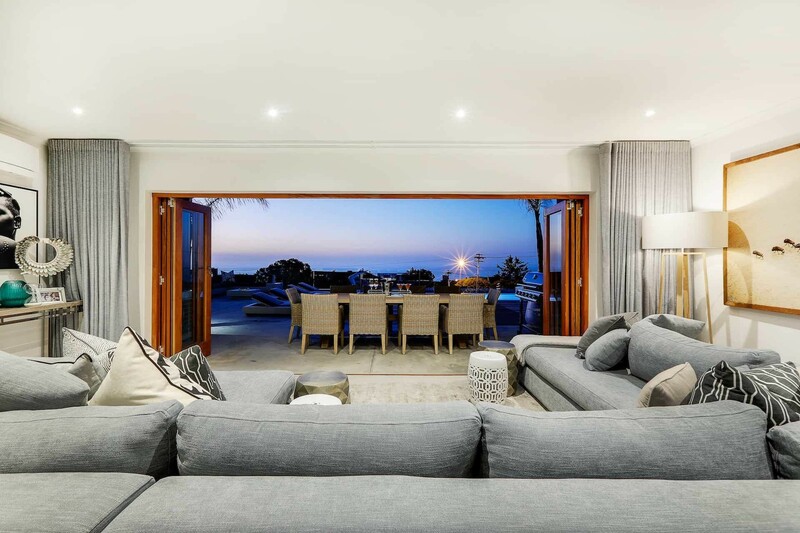 The lower level of the house features a stylish lounge, dining and entertainment area which flows out onto a large terrace with wooden decking and a rim-flow swimming pool which seems to connect with the ocean in the distance. 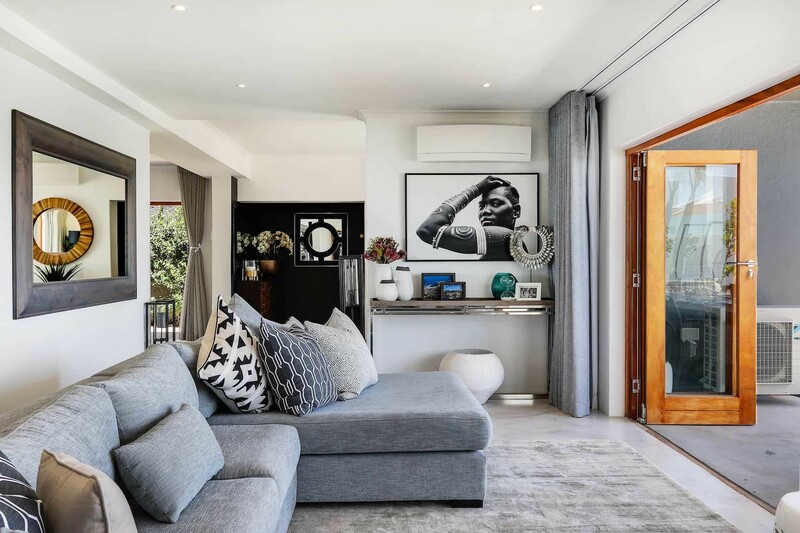 The spacious, open-plan entertainment area offers comfortable couches, a flat screen television and air-conditioning, while an outdoor lounge area on the deck is the ideal place to relax over sundowners. 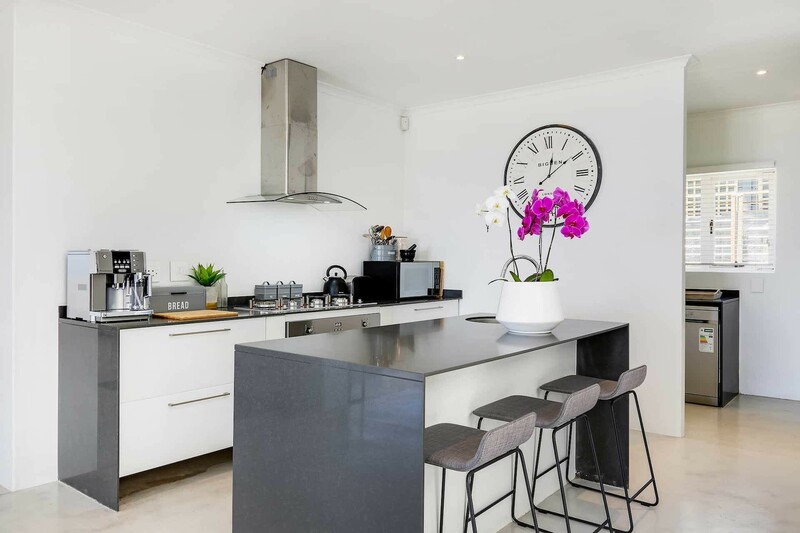 A fully-equipped state-of-the-art kitchen in shades of white & charcoal has a sleek breakfast bar and stools, and top-of-the-range appliances. 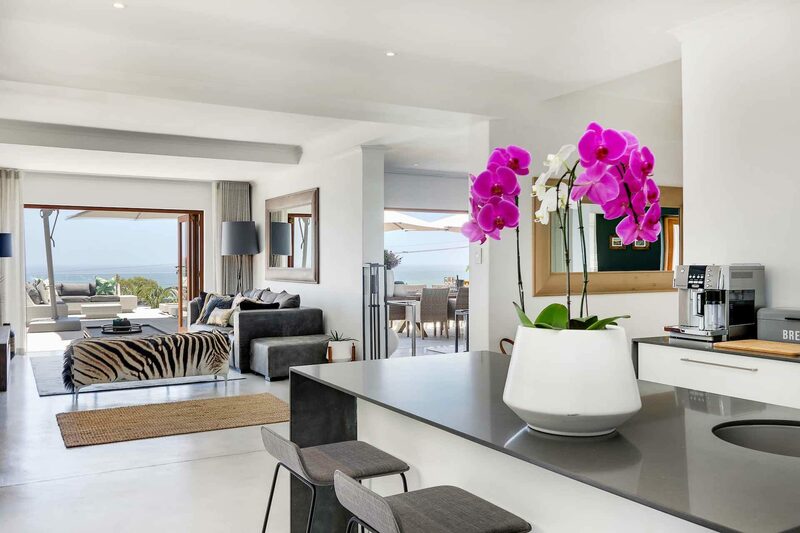 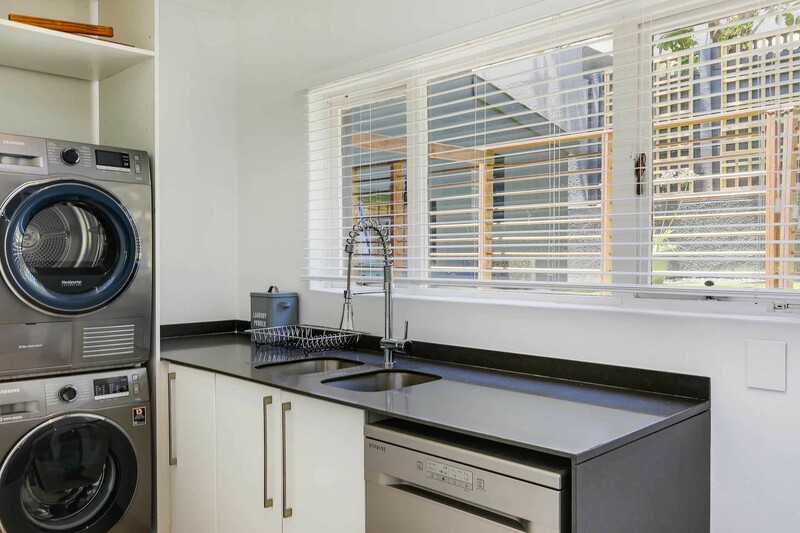 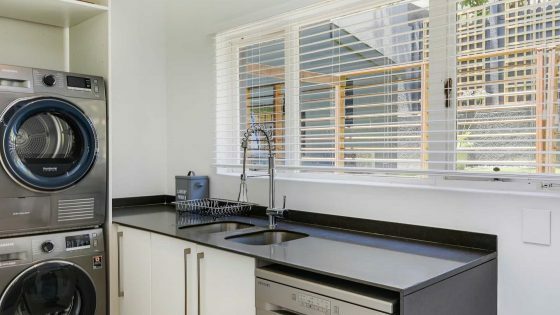 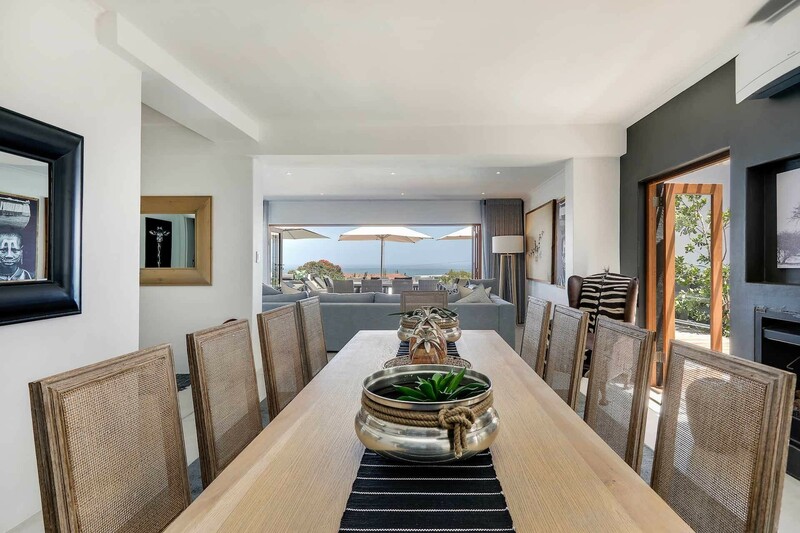 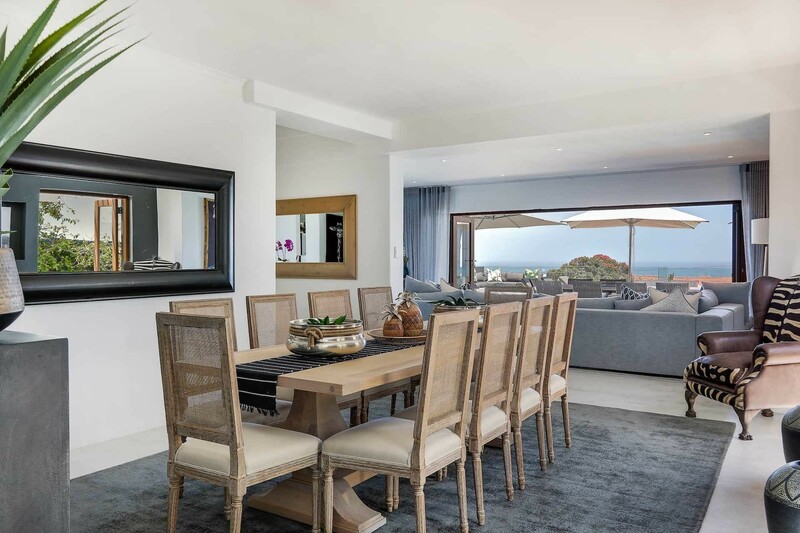 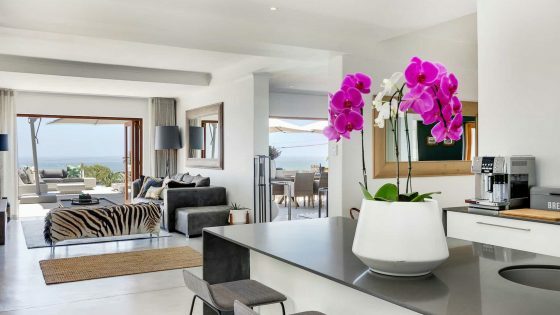 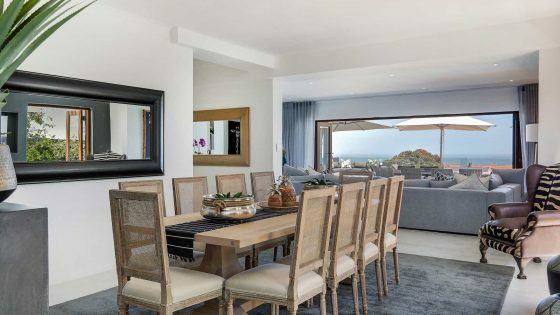 The kitchen flows into the open-plan dining room where up to eight guests can dine together, which is adjacent to a beautifully furnished lounge with couches, armchairs, flat-screen television and spectacular ocean views. 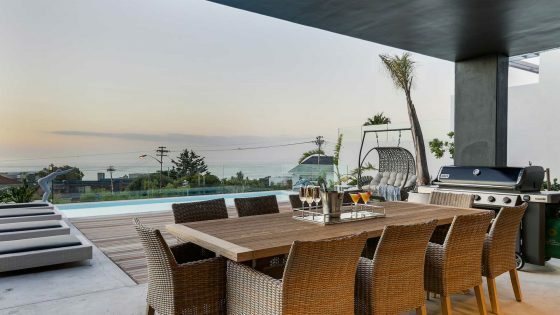 The lounge and dining room connect seamlessly with the large terrace, which has a glass balustrade, comfy couches, outdoor seating for six people, and a barbeque. 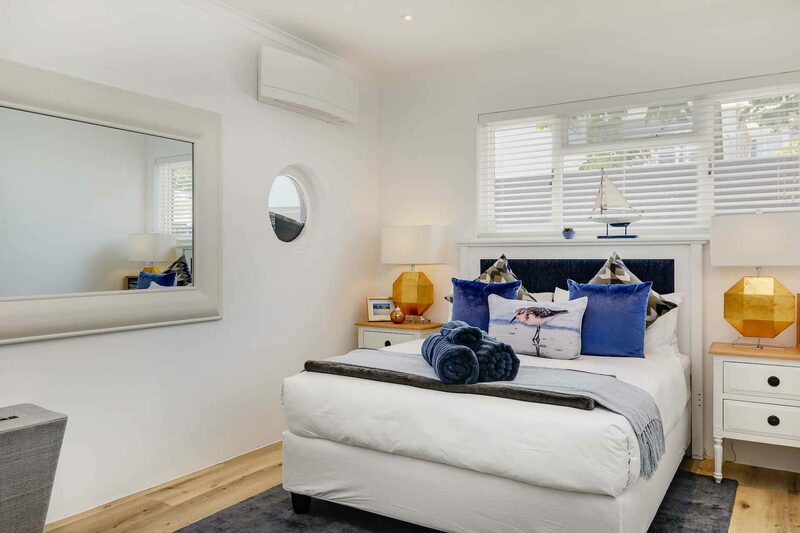 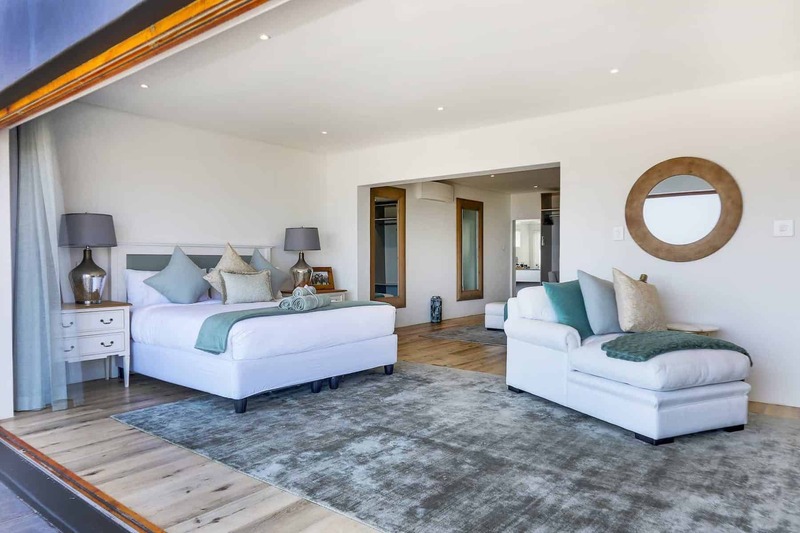 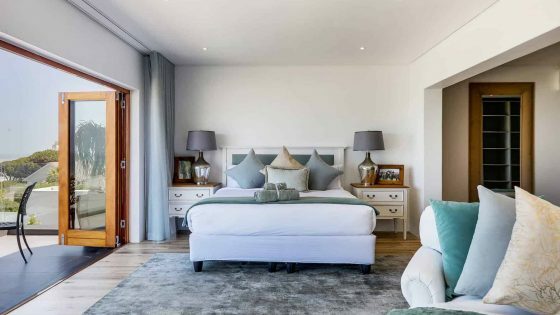 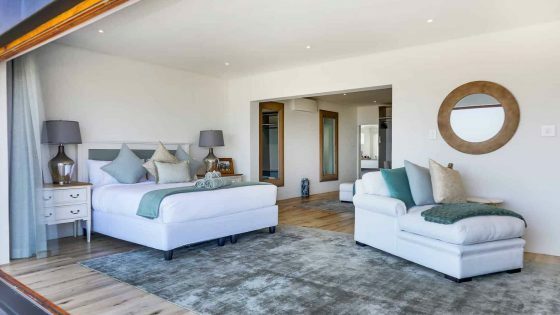 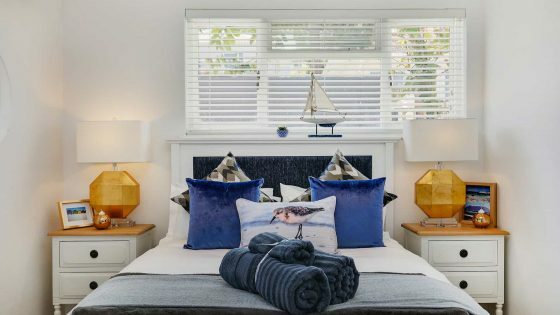 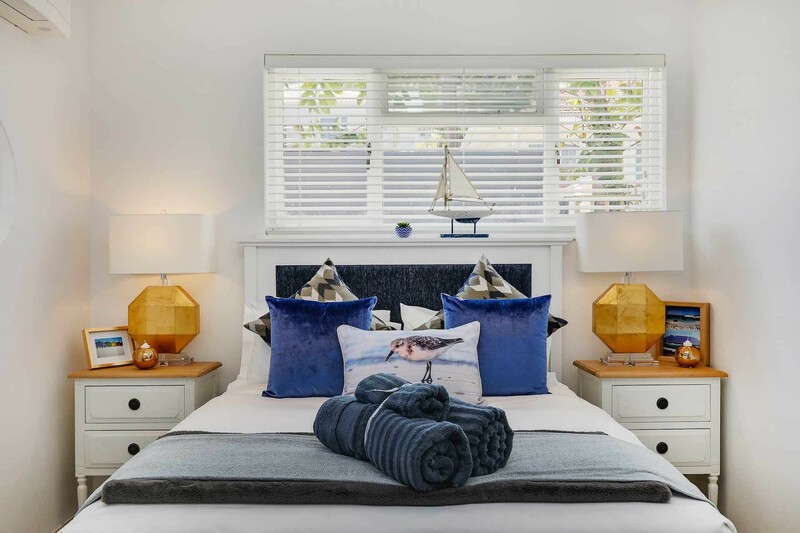 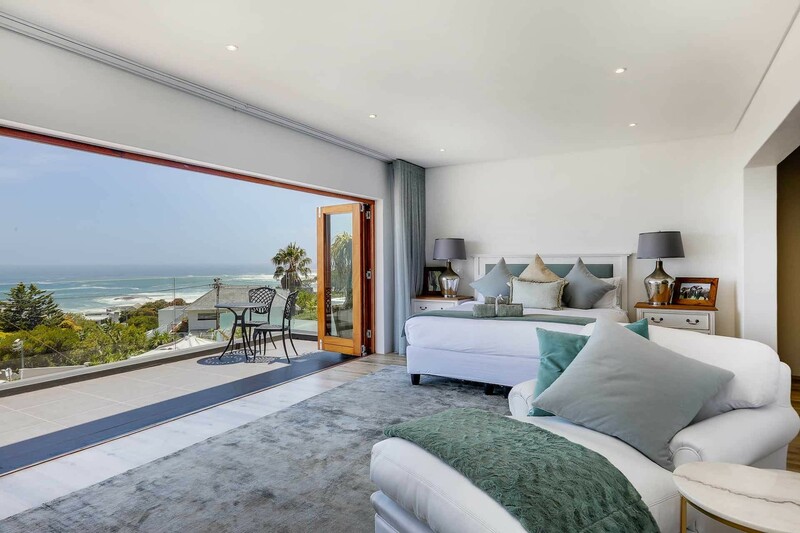 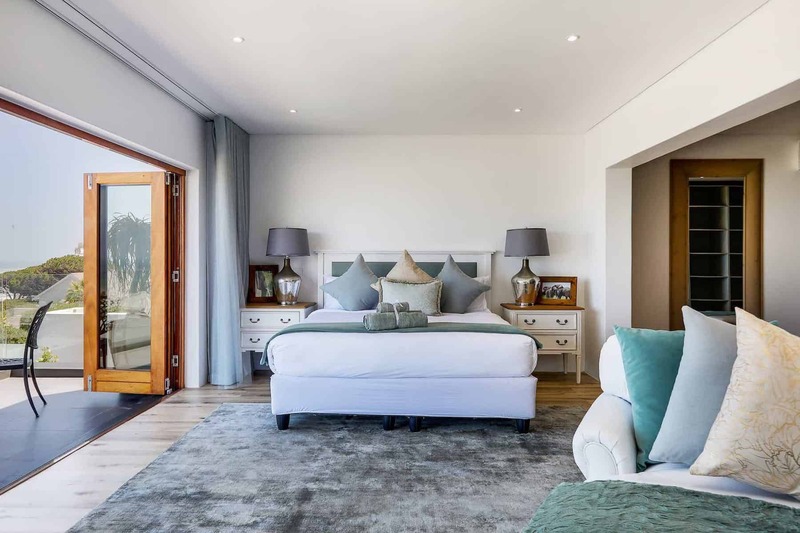 The upper level of the house features four bedrooms, including the gorgeous master bedroom with king-size bed, open-plan en-suite bathroom with bath and shower, air-conditioning and stunning ocean views. 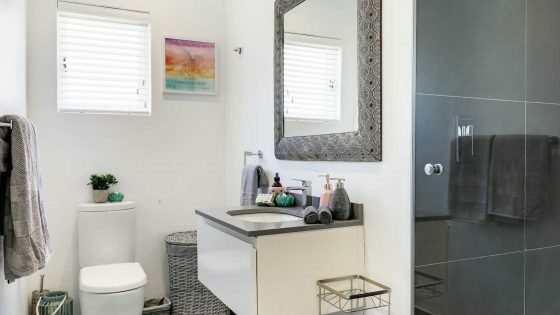 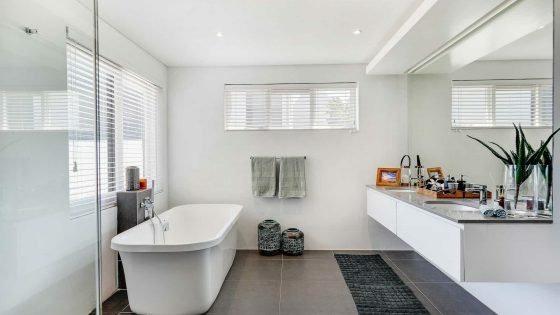 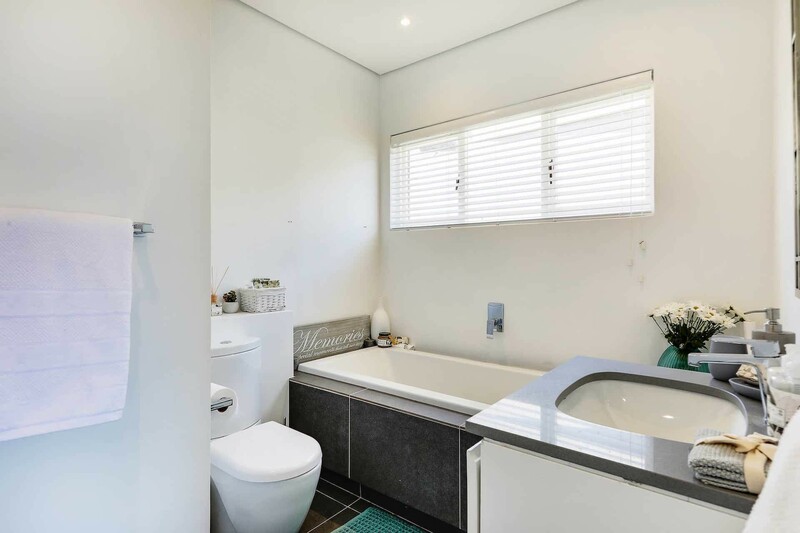 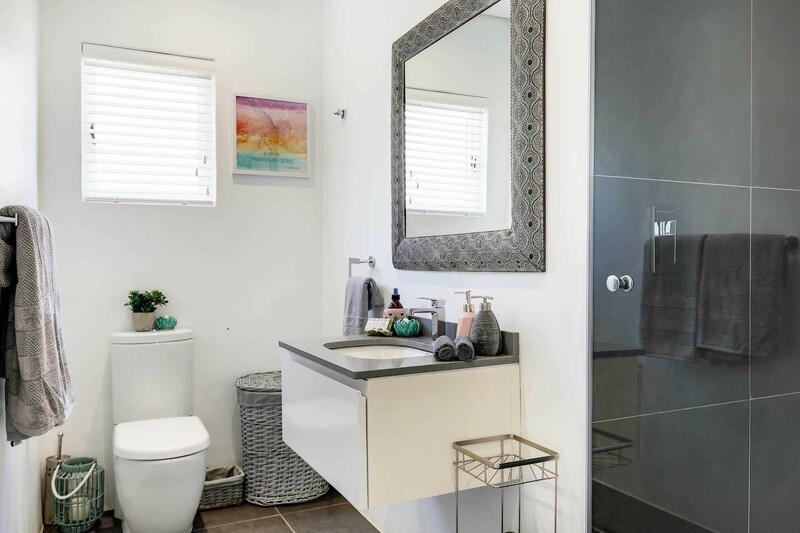 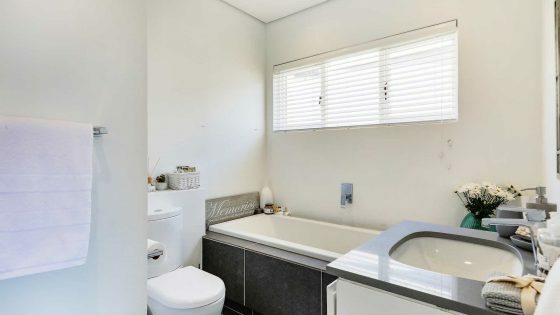 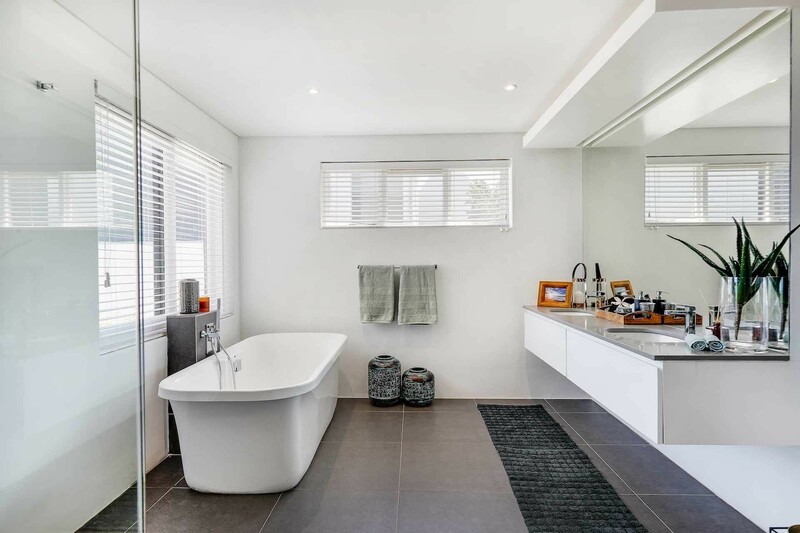 Four bathrooms are designed and decorated in minimalist hues of white with natural accents and have glass-enclosed walk-in showers, soaking tubs, and single vanities. 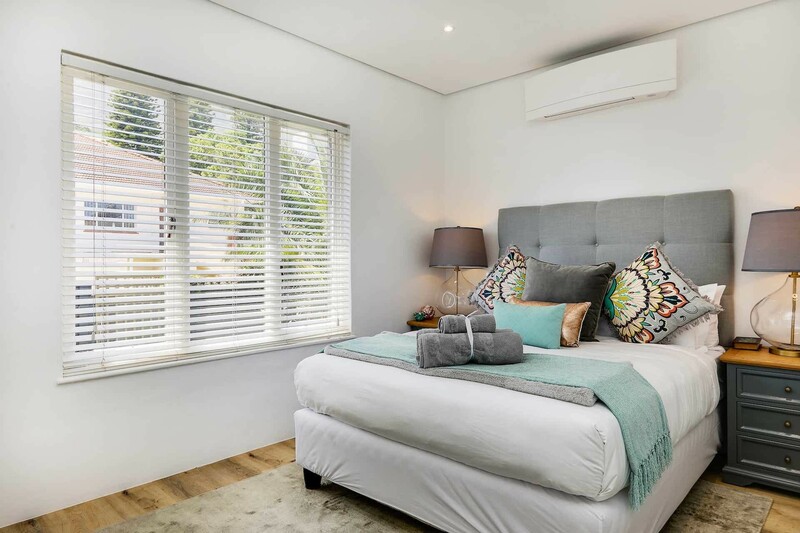 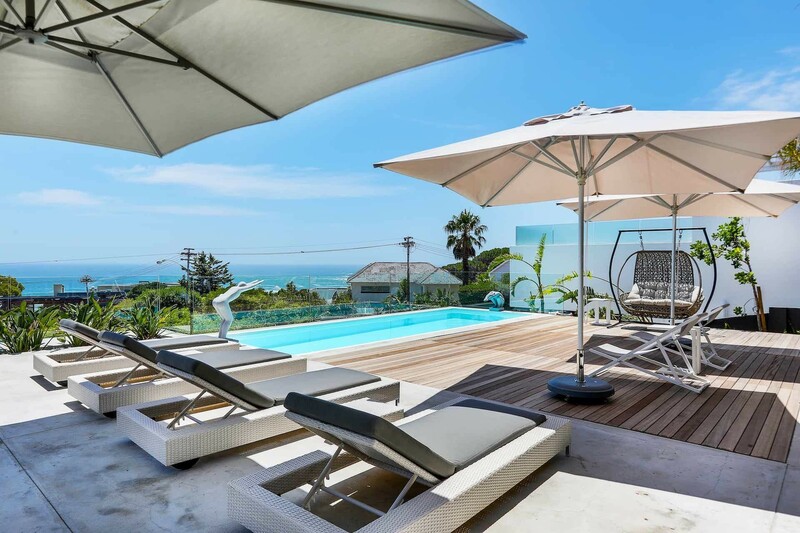 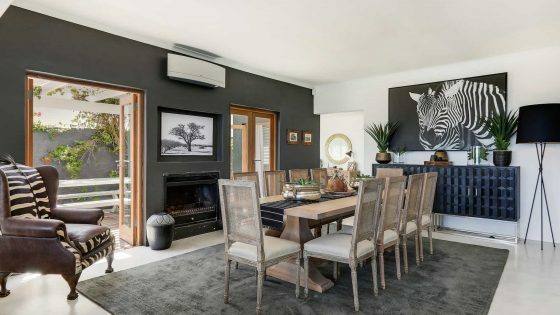 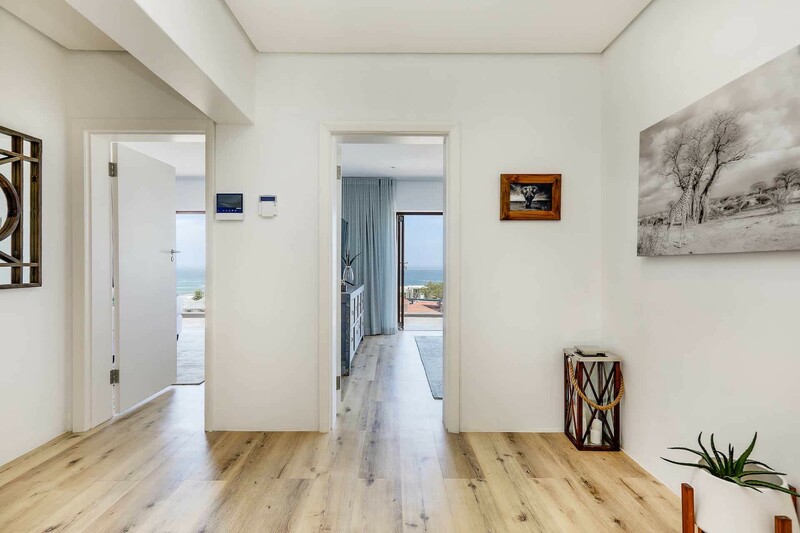 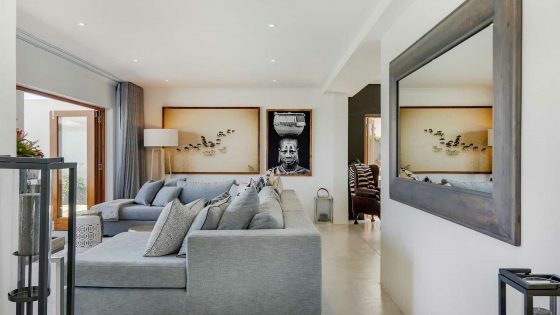 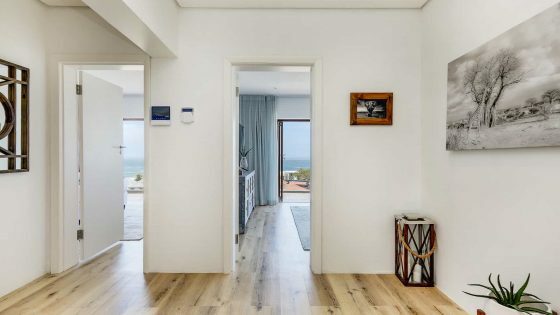 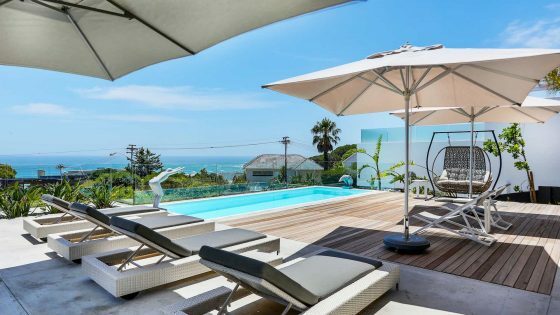 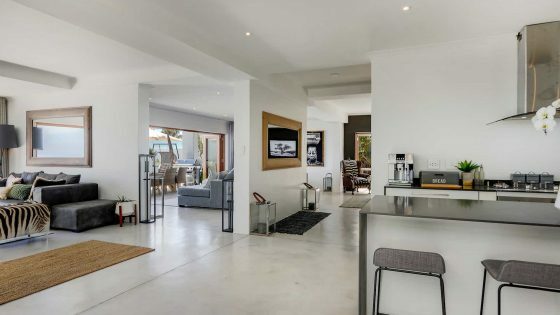 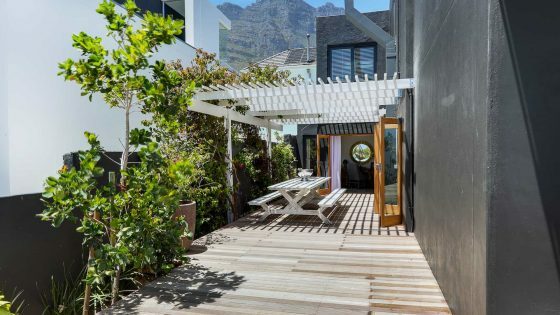 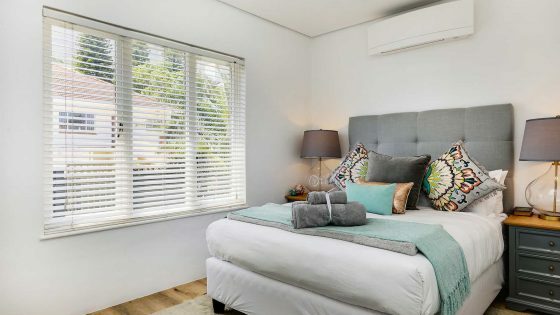 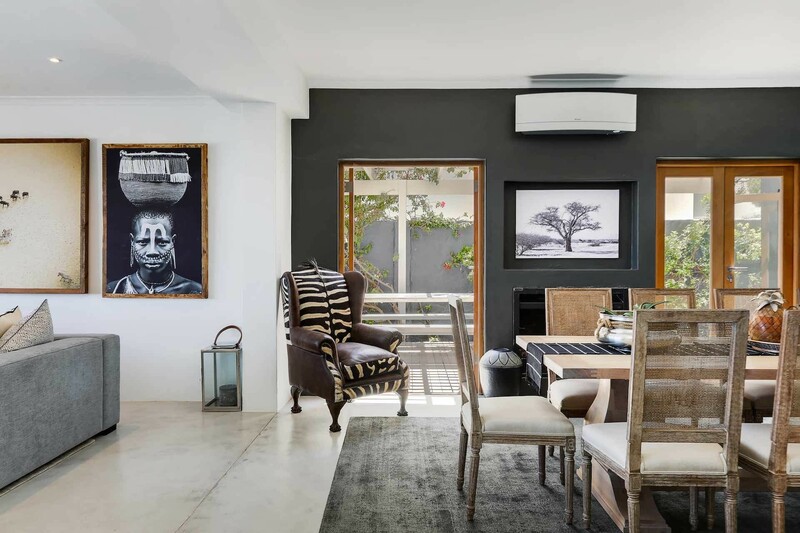 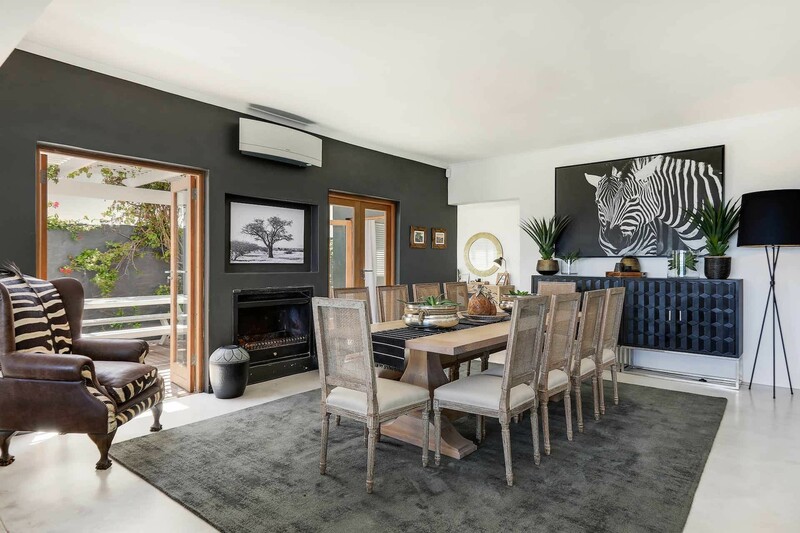 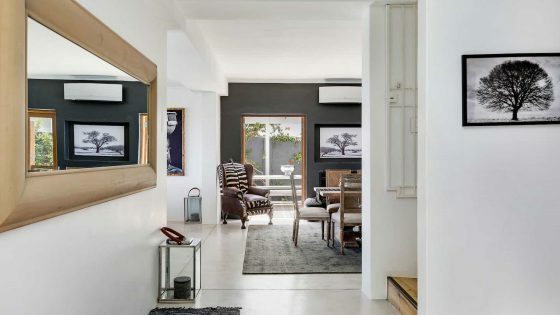 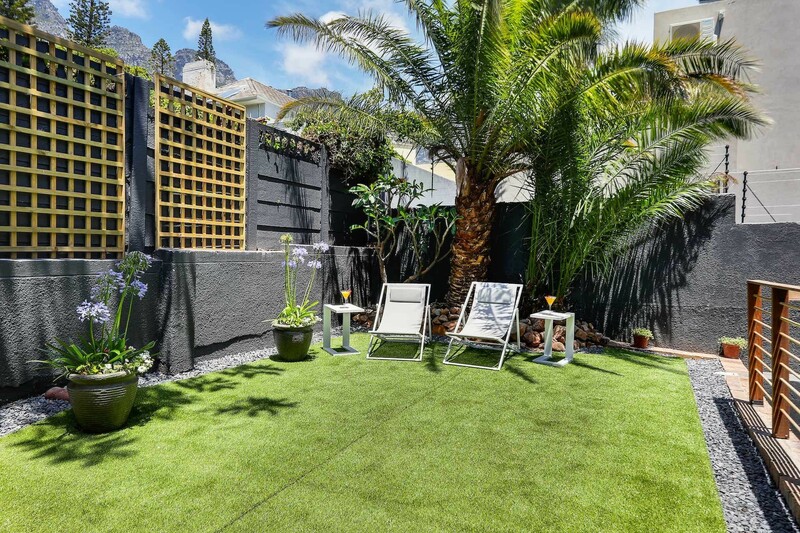 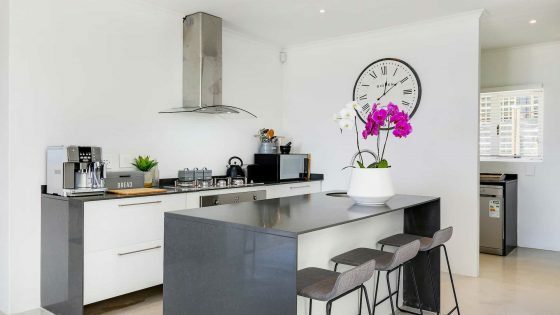 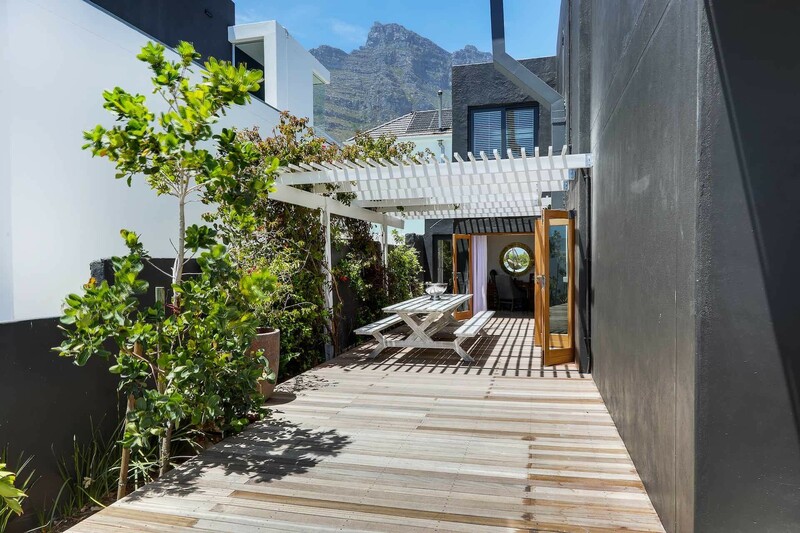 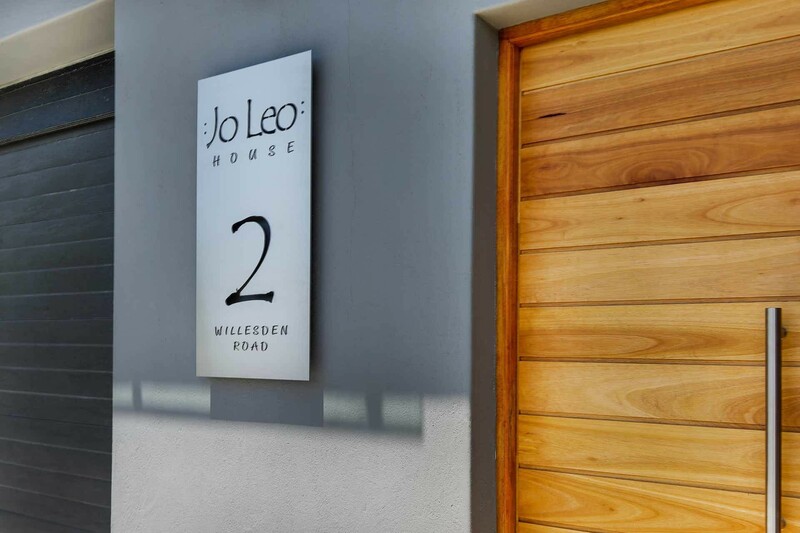 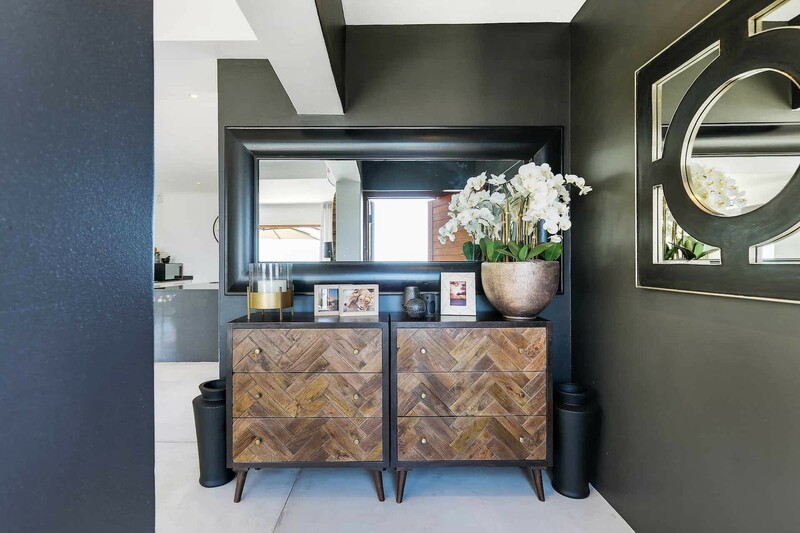 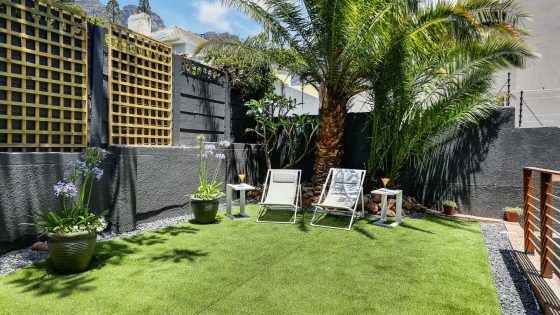 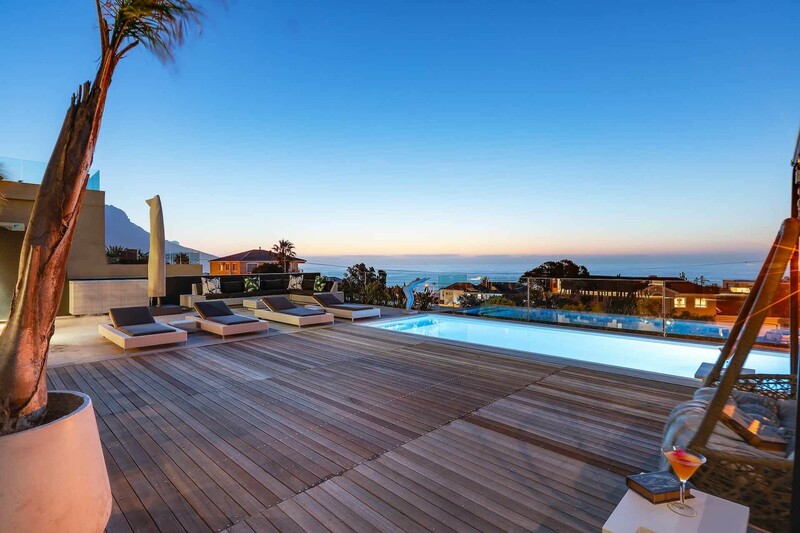 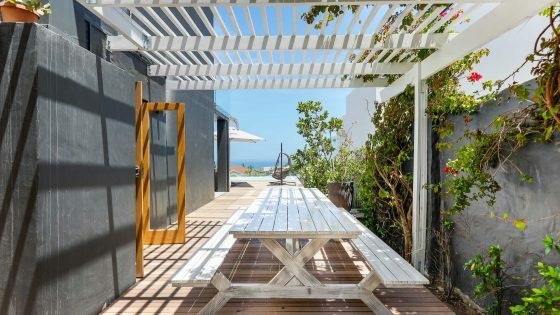 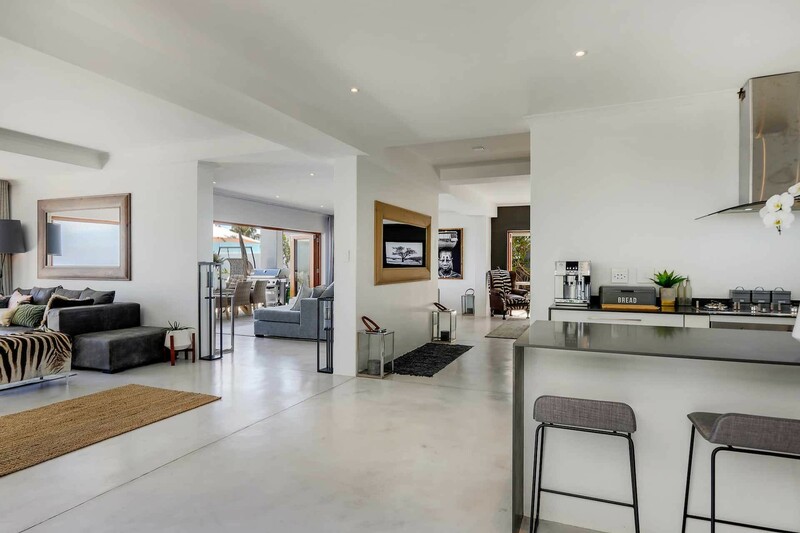 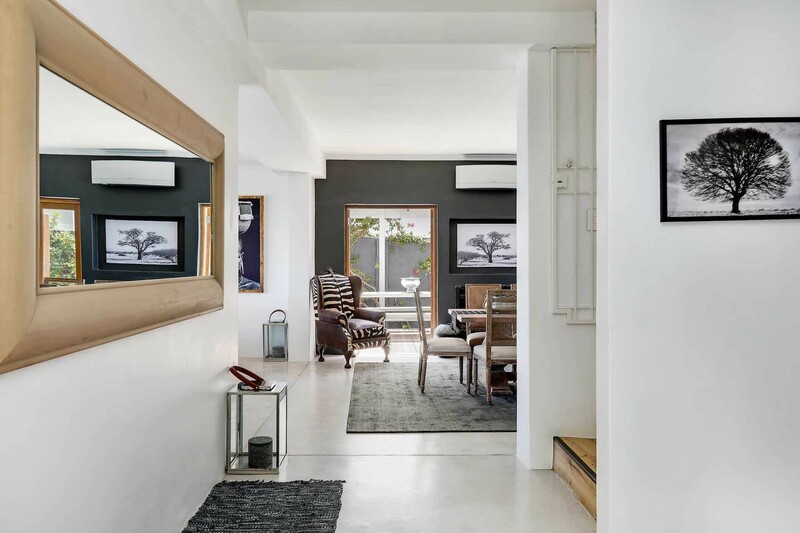 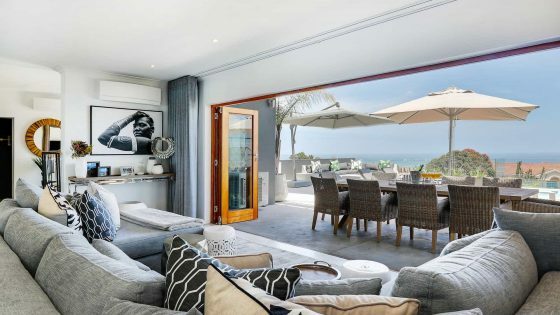 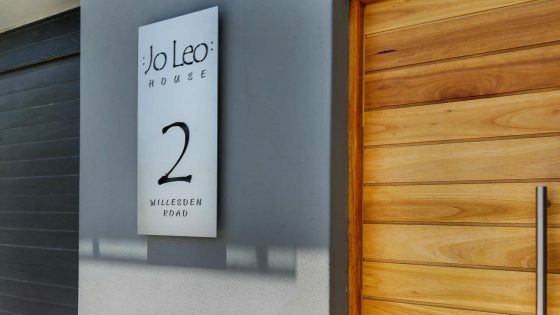 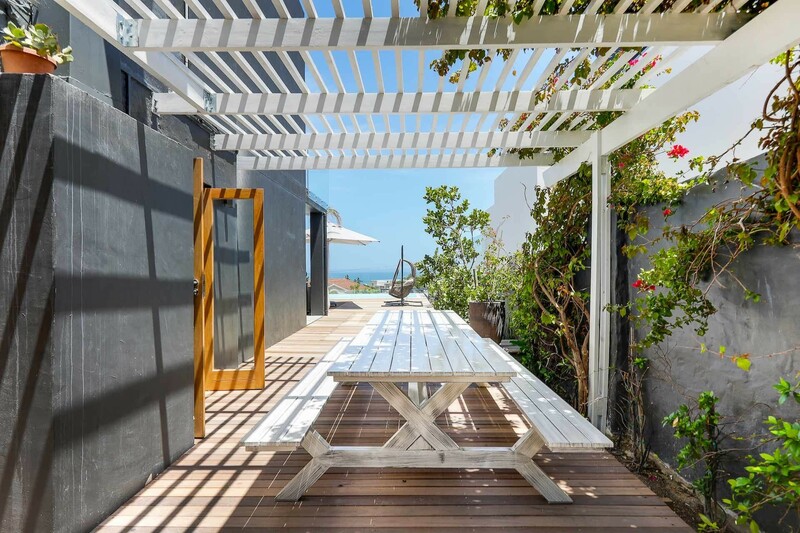 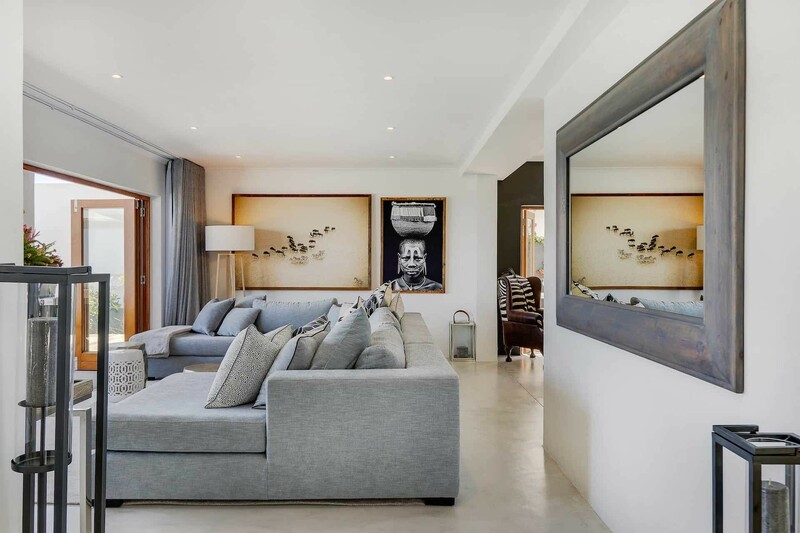 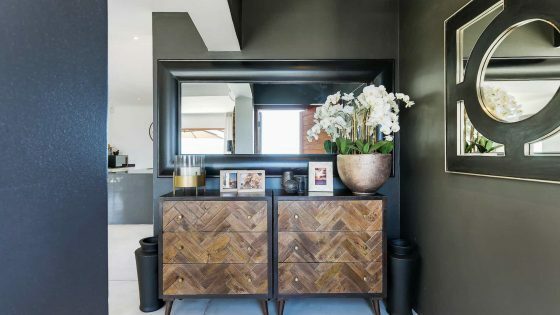 Fully secure with an alarm, this elegant Camps Bay home boasts a double garage, as well as off-street parking in the driveway. 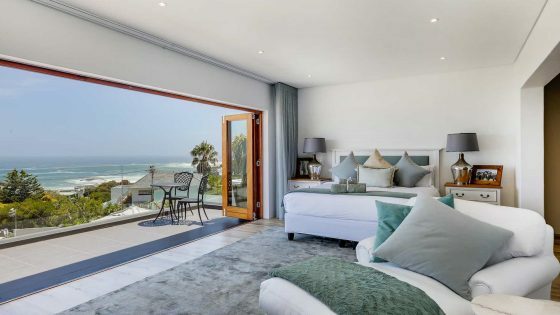 A short drive will take you to the beautiful Blue Flag beaches of Camps Bay and Clifton, as well as the iconic Table Mountain and the bustling city centre.